Home / Latest News / Adoption of Bonemine. We were hoping for good news today and it has indeed come to pass! 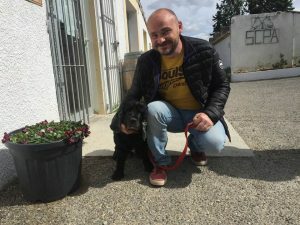 Exactly 10 days ago an elderly cocker spaniel was brought to the refuge having been found in a local village. 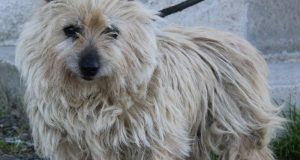 She was not identified, and has a number of health issues, but nothing too serious, and it looks like she had recently been at the toiletteur; no stray dog, this. 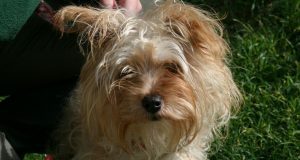 The ScPA named her Bonemine (they were on an Asterix kick) and set about looking for her owners. In the meantime, Bonemine had attracted some admirers! Nigel and Julian lost their own elderly American cocker spaniel last year, and when they saw Bonemine, they decided to offer her a home. A visit earlier this week confirmed this, and they came along today to take her for a short walk and to make sure she would be happy with them. Being used to blind dogs, they are already prepared for the daily routine of eye-care that Bonemine requires. And watching them walking her, you just know that she is going to be well looked after and loved for whatever time remains. Bonemine is a very lucky dog to be offered a home at her age and we say huge thanks to them and look forward to news and photos. 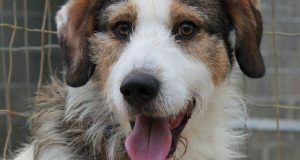 We have news from both Montpelier and Animal Trust, where Baxter and Loubi have both found homes this week. So there is good news to almost end the week. But don’t forget that the refuge is open again tomorrow, so perhaps we will have more adoptions.